The Appeal of the Flat Deck ‘Bird Convertible. Now one would think for a guy who can throw into conversation things like Zagato Carrozzeria and Thupp and Maberly that I am all about furrin’ cars and furrin’ cars only. But down deep, I admit that my roots are in Detroit where I grew up. 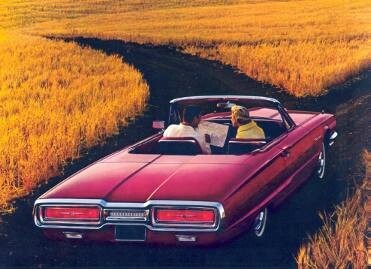 And sometimes memories come back like the time a neighbor took me for a ride in a mint condition blue ’64 or ’65 Thunderbird convertible. Now originally all the ’55 through ’57 Thunderbirds were convertibles though they came with a lift off hardtop. That was when they were two seaters. Then they redesigned them (some say for the worse) to be a four seater 1958-’60 “Square Bird” which had only a modest sales boost because it was a four seater. And then it got a little better styling wise with the 1961-1963 “Bullet Bird”, which had ever-so-tiny tailfins and sort of “rocket exhaust” taillights. The highlight of that model was in ’62 and ’63, the Sports Roadster, which made a four seater into a temporary two seater with the addition of a fiberglass tonneau bearing headrest fairings covering the rear seats. But the really radical one that recently floated into my world view was the ’64 which I call the flat deck Bird. (for some reason T-birders call them “the Flair bird.” This was a big success. It brought back fender skirts for the rear and seemed longer, lower and wider. It had a convertible top that folded down similar to that in the Lincoln Continental four door convertible easier, making a completely flush deck but the problem was that top down it took up most of the space. But looking on this car’s role as an occasional car, not your daily commuter, that’s OK with me for the drama of all those square yards of painted steel leading up to the rear seats which like some dive bar in the ‘50s are “wrap-around” sort of. Non stock wheels on this ’64. Trunk opened from the rear. The car is set low, a mere 53 inches from the road to the top of the windshield, does the trick. The ’64 and ’65 have one difference in styling. In the rear the taillights are grouped not in two separate rectangles in the ’65 but in one broad sweep from one side to the other, the ‘65 also boasting sequential rear taillights. When you indicate a turn, each of the six bulbs per side light up in succession from the center outward. Though Ford had discontinued the Sports Roadster with the advent of the ’64 T-Bird, Ford dealers still wanted a hard tonneau to cover the rear seats in so outside firms provided it as a dealer option. It was not at all as classy as the ’63 Sports Roadster tonneau. The main appeal of this car to me is the flat rear deck including the convertible top when stowed. The T-bird’s power-operated top stows in the trunk. The rear-hinged trunklid first raises, the fabric top in slow motion collapses into place before the lid snaps shut. Top down, the car’s profile is totally smooth; there’s no bulge of folded canvas under a tonneau cover to compromise the design’s horizontality. It also leaves a nice, broad, flat seat upon which a parade princess can spread her full skirt and wave to the crowd. Wire wheels were an option, knock off was fake. The interior is, in a word, a ‘60s prediction of the future. Ford in those days didn’t often give individual designers much credit, the name John Najjar has been mentioned. A nice feature at the time was the Swing-Away steering wheel that swings 10 inches to the right, making it easy for the driver to get out. The driver seat also which tilts the bottom cushion to the left, helping an occupant egress. One trouble with this car is that it only came with a big block. But you need that number of cubic inches (390 at first) to get the power to drive a car 1,000 lbs. heavier than a Ford full size sedan. In 1966 Ford gave it a bit of a boost, raising the 390 Special V-8 from 300 horsepower to 315 horsepower for 1966. It was still slow compared to some of the competition but this was a cruiser car. Alas the engine was already showing its age so if you wanted a fast bird you ordered the optional 428 V8, at 345 horsepower for an additional $64.30 (ah, those were the days of reasonable option prices…) The 428’s additional muscle could be felt. As far as rarity these are not like gullwing Mercedes, a car which only saw 1,400 built but are much more common. But you have to figure over 50 years has gone by, many have been wrecked, many rusted away, and to me they make a statement like no other American car. I am a little worried about the top freezing in place either going up or coming down but the owner of one car I just talked to said that only happened to him once, and when he replaced the motor it works perfectly. And I am balancing that against some of the maintenance on other collectibles I have owned (let me tell you about replacing he leather diaphragm in the fuel injection of a ’54 Mercedes 300SL…). Gauges were set into little spheres. Bucket seats were thinner than most. What I want the car for is to go out for coffee in the small town I hang out in, a town with a view of the nearby mountain (snow topped in winter, a treat for So Cal…) playing some period music, remembering what it was like in the days before everybody’s eyes were glued to a tiny telephone screen. The main appeal of this car to me is the flat rear deck including the convertible top when stowed. The T-bird’s power-operated top stows in the trunk. What a wonderful little essay. Thank you for helping my mind waft back to those simpler days of my youth. yes, I always liked the two series of which you speak. Very nice lines, considering its lineage, the ’58-’59 (squarebirds) years that had a limited following as you mention, they were not all that attractive. I still remember saying why oh why did they do away with the little Birds? But, Ford did affect the competition, and in a big way. The ’58-’59 series lead to a new “model” the “Personal Luxury” cars. And that led GM to create their own Personal Luxury” series. Arguably, three of the nicest looking cars of that era. The Olds Toronado, Buick Rivera, and the Caddilac Eldorado all of which I personally, hold in high esteem, for what that’s worth. All of those cars, Ford and GM were never again equaled in their beautiful form (eye appeal) follows function styling. Once again, thanks for the trip back to a long gone era. You forgot to mention that it was placed prominently in the film, “Thelma & Louise”. They drove a beautiful, mint condition, light metallic blue, 1966 model, the one you like with the single horizontal taillight that lit up sequentially. My Father bought a ’70 Thunderbird years ago similar to the one in this brochure. I was allowed to drive it sometimes and it was a real treat especially on a date. A T-bird forum could answer that but one interpretation I have is that the top , frame and all. goes all the way to the bottom of the trunk compartment, It is similar to the Lincoln Continental convertible top. I thought myself that it is overdesigned. If they just has the forward section operate by hand they could have saved a lot of motor effort but they anted it all to be at the touch of button. I wonder if the failure rate is better than the modern soft-tops that fold the same way–if its more reliable?